"Dreh die Musik auf - Chris Brown ist wieder da!" So oder so ähnlich lautet die Message der brandneuen Uptempo-Single des US-Superstars, die er mit Hilfe des Produktions-Duo The Underdogs (Beyoncé, Aretha Franklin, Justin Timberlake u.a.) zusammenzimmerte. Es ist die erste Vorabauskopplung aus Browns fünftem Album "Fortune", das in Kürze erscheinen wird und der Follow-Up zum letztjährigen Album "F.A.M.E." ist, mit dem der 22-jährige erstmals Platz eins der US-Charts erreichte. Edit: This has grown on me quite a bit, and good video as well. Und hoch auf 5*, der Beat ist schon einzigartig und gefällt mir immer besser! The derision that Chris Brown continues to cop is more than justified in my opinion. While I can ignore an uneventful artist who notches up a hit now and then, I always just question the need for such an artist. I suppose image comes into play and once someone develops a fandom for an artist, you can hardly blame them for perpetuating it. Chris Brown SHOULD be the exception to this. In the wake of certain events which should result in him being a social pariah, Chris Brown manages to be more successful than ever. In the meantime, he shows no real remorse (that doesn't seem more along the lines of wishing he hadn't been caught. Debatable but that's my view), and persists in more ridiculous, news grabbing behaviour. As I mentioned before, the real problem is that the music continues to be a non-event. 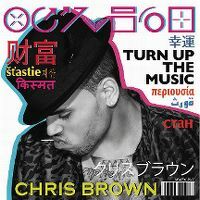 "Turn Up The Music" is the biggest non-event of a hit in his catalogue of recent times. In its desperate attempts to latch onto a melody, I always just end up irritated by the soulless overproduction. The real shame is that this gets to hog the spotlight over contemporaries who actually are worthy of attention. In all honesty, this extends to the vast majority, because when I listen to anyone else, I don't have the image in my mind that they have in fact, savagely beaten up a female celebrity (which is of course exemplified as I have an actual image of this). That's not to say I can't enjoy any of his hits, admittedly I do. But this is one of many that sicken me. Mal wieder ein Autotune-verseuchter Electro-Track mit viel "ohohohohohohooooooo", wenig Text und möglichst häufige Wiederholung der immer gleichen Textpassagen. Musikalisch relativ wertarm wie so vieles in der jüngeren Vergangenheit, was gerade aus den Vereinigten Staaten zu uns rüberschwappte. Don't like it, but maybe it can grow on me. Sein nächster grosser Hit, wird wohl auch hier ein Erfolg werden. was soll man da noch machen?! wer erlaubt es denn so etwas überhaupt verkaufen zu lassen?! Don't mind it. Enjoyable enough. Find es witzig... Während ich von Flo Rida, David Guetta beispielsweise schon etwas ermüdet bin (weil da aktuell nix spannendes mehr kommt), bin ich von Chris Brown, Ne-Yo, Taio Cruz u. Jason Derülo immer noch recht angetan. Klaro der Track "Turn up the music" stellt keine musikalische Revolution dar. Aaaber er ist temperamentvoll u. sauber produziert. Der Refrain prägt sich ein u. im Club will ich lieber solch einen Song hören als was total abgegriffenes. Really boring, lame, unimaginative and generic. Vocally bad as well. Didn't deserve to go top ten. Just wish he would dissapear already. Das ist einfach äußerst schlechte Musik. Ik zet dit meteen uit.